Now that Summer Vacation is almost over, I have been decluttering the children's closets to make sure they have clothes that fit them for school, the holidays, and the colder weather. A by-product of this activity is a huge pile of clothes are too stained, or beyond repair, and thus can't be used, given away, or donated to charity. Meanwhile, we struggle with the fashion challenge of finding modest and rugged play dresses for the girls. We are constantly on the lookout for long-sleeved play dresses. We are weary warriors on the belly-shirt battlefront. FrankenDresses are my solution to all of these problems. 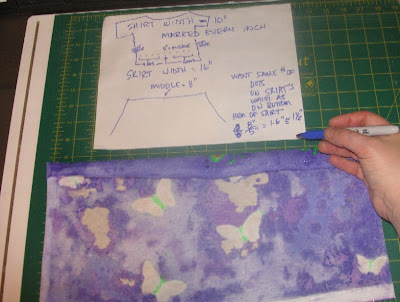 The materials are free, the whole project can be accomplished with no ironing or pressing, minimal measuring, and (since I'm stuck sewing by hand) there is only one quick seam to sew. 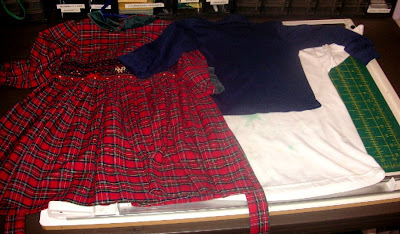 This method can be used to make inexpensive matching dresses for school performances or teams, and to make costumes. The dresses in this example are made for Gretta, who is three years old and wears a size 3T. 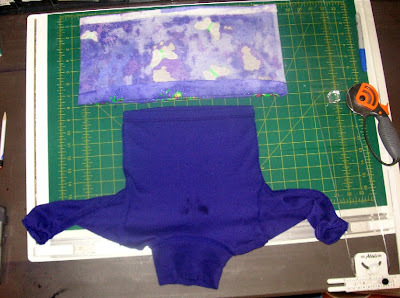 The turtleneck we used is in fine condition, but it has stains on it, and it is a belly-shirt when she raises her arms. The neck and sleeves fit her, though. 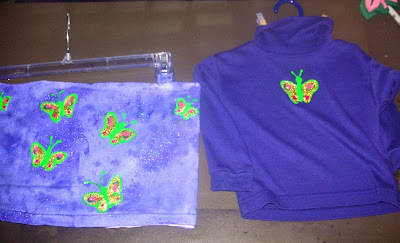 The t-shirt belonged to an older sister and has been used as a "painting shirt" a few too many times. Use a dress that fits the child well as a guideline for the length of the dress. Arrange the larger shirt under the top shirt, such that it is about one inch longer than the guideline dress. This will give room for the fold and the seam allowance. The truly frugal will lob off the sleeves of the shirt to make a disposable baby bib from the remainder. 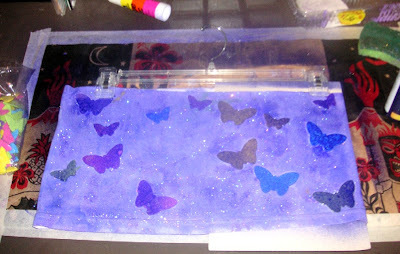 Insert a piece of cardboard between the layers of the skirt and decorate it. 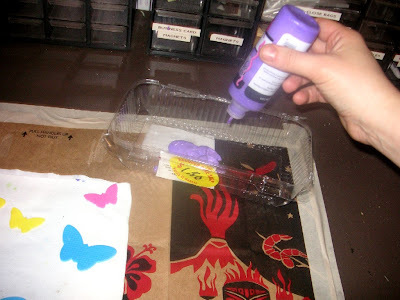 As a stencil, I used those foam shapes that come home on the kids' projects from school and at birthdays They are available at craft stores, but could easily just cut shapes from anything thick and waterproof. 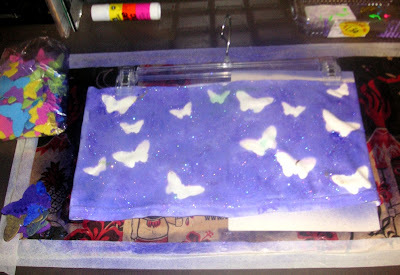 I attached these in quasi-random places with a glue stick. Don't put the stencil all the way on the edges of the skirt. 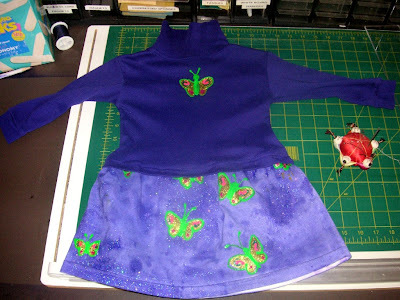 Leave a little room so the skirt can be rotated a bit, allowing the edges to be matched for color. 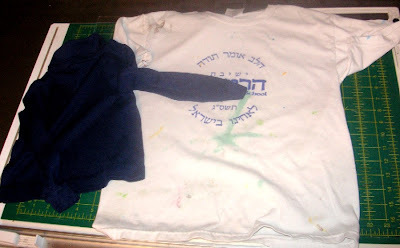 Use fabric paint color that is compatible with the color of the top shirt. 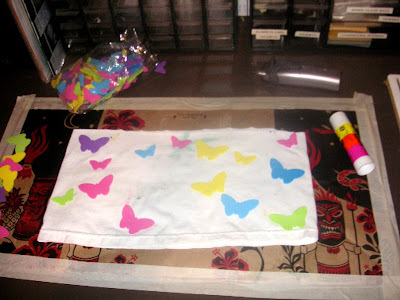 I compromised and used a combination of the two because (a) I'm too cheap to only use the more expensive product, (b) I wanted to finish the bottle of fabric paint that was not enough to save, (c) that bottle wasn't enough to cover the whole skirt, and (d) using more than one color of paint helped cover up the little splotches that typically form where the spray-nozzled droplets build up. 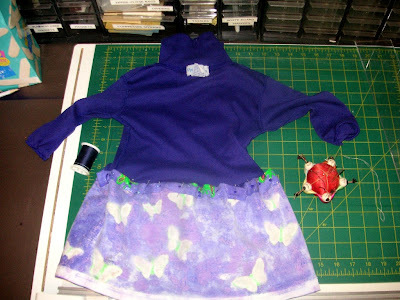 When the front is completed, rotate the skirt a bit, allowing the edges to be matched for color and decorate the back of the skirt. 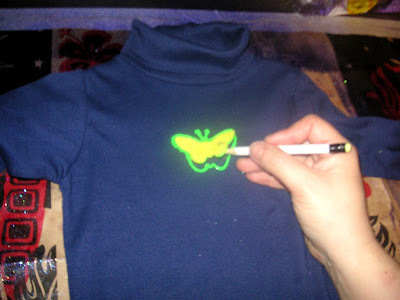 Using one of the same stencils as for the skirt, cover the stains on the top shirt with the same type of decoration. The goal is to make it seem as though the shirt and skirt were meant for one another. 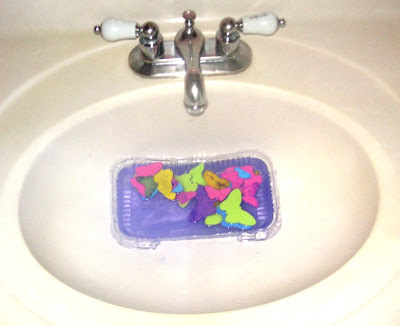 The foam shapes can be washed and re-used. 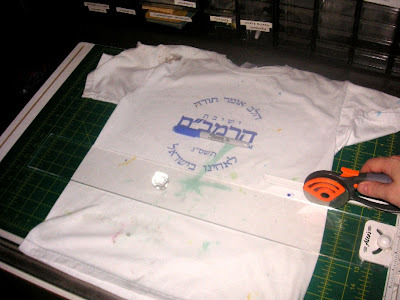 Hang the shirt and skirt until thoroughly dry (usually overnight). 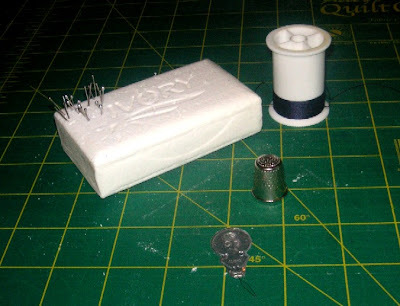 The pinning and sewing will be easier if you use soap as a pin-cushion, as the soap will ease the pins and needle through the fabric. I also recommend a thimble for pushing the needle through the paint, and for those of us over forty, a needle-threader (sold 3/$1 usually) is a lifesaver. Match the thread color to the top shirt. Turn both the skirt and the shirt inside-out. 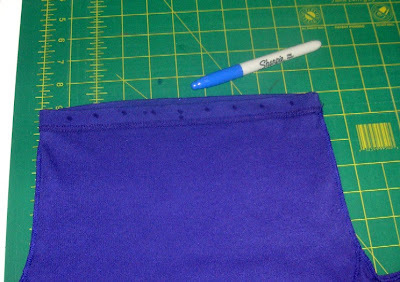 Fold over the skirt where it was cut (not at the bottom, where there is already a finished seam, but at the unfinished cut end) about one-half to three-quarters of an inch, using either a ruler (recommended) or whatever you have on hand (pen, scissors, soda can) to make sure both vertical sides of the skirt are the same measurement. Measure the width of the shirt at its hem. On the inside of the hem (which is facing out now, because we turned it inside-out earlier, right?) mark the middle with two dots. Mark with one dot every inch in between the middle and the edge, working outward from the middle to each side. 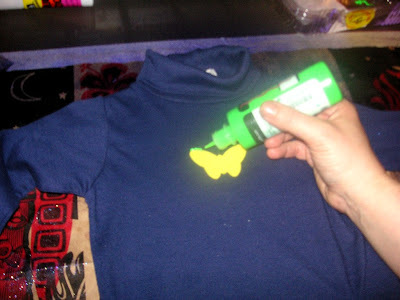 Do this on both the front and back of the shirt. Measure the skirt. Measure the width of the skirt at its folded inside edge. Mark the middle of the skirt width with two dots. free stuff, after all. Just focus on making the area between the dots as even as possible. Don't obsess. Working outward from the double-dots in the middle of the skirt, mark the the same number of dots on the skirt. 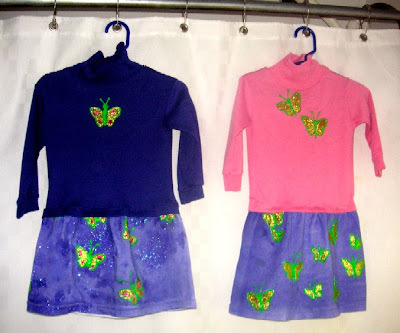 (In my example, both the shirt and the skirt had four dots between the middle and the edges.) Do this on both the front and back of the skirt. 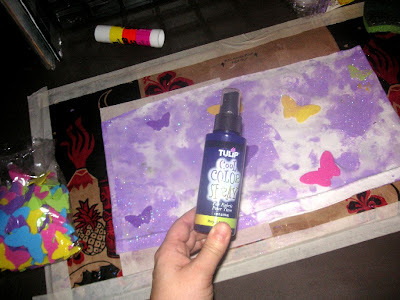 Make a line at the edges to mark them. Match up the dots and pin. Start with the middles/double dots on both the front and back of the shirt. 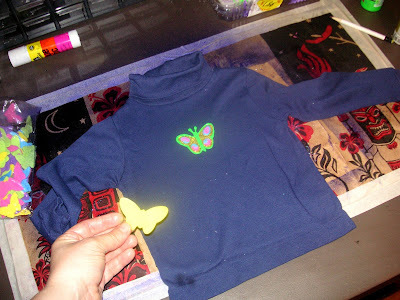 Then match up the side seams of the top shirt with the marked line on the edges. 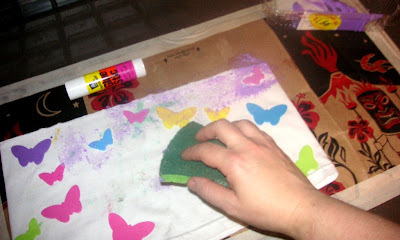 Then get the single dots between the side seams and the middles. When it's all pinned, turn the dress right-side-out to check it before sewing. Don't worry if it looks a bit clunky. When the pins are removed it will look better. Muwahahah! They're Alive!!!! Celebrate, because you're done. Just watch out for those torch-wielding peasants! Update: Here they are, on Gretta! Don't forget the pics of the model. I'll be checking for the cutie! Those are adorable. I need to have children now, so I can make some. But what if they're boys? Must give this some thought. Thanks! You can never find a toddler when you need one...! Boys use up their clothes so thoroughly, that the fibers of their garments ascend to Heaven directly, with no need for a proper burial in the Clothing Cemetery. Jonathan can just think about a pair of pants hanging in his closet, and the knees rip. We get bags of used clothes from friends with many girls. A dress can go through three families of multiple girls, and only get downgraded from Shabbat Dress to School Dress to Play Dress status. With boys, there is very little to share after the first one gets a shot at a pair of pants. in step 7, is "to fix" supposed to be "too thick" ? YES! Thank you so much for letting me know. It's fixed now. Apparently, I need to be a bit more careful editing dictated text before hitting "publish"! What a brilliant idea! But you may want to correct the typo in step 3!! Thank you, and Yikes!!! I almost wrote a comment asking you to identify the typo, because I couldn't see it after about 7 re-readings! Thank you for pointing it out, and for doing it so subtly. 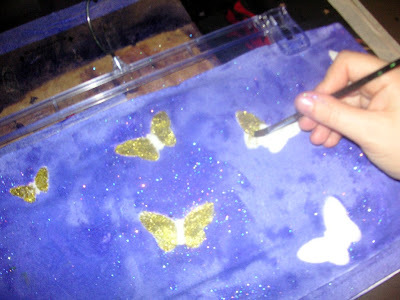 i'D LIKE TO COMMENT THE DRESSES LOOK REALLY GREAT EVEN BEFORE YOU APPLY THE EXTRA BUTTERFLY PAINT. PERSONALLY I PREFERRED THE SIMPLIFIED LOOK. GREAT IDEA! AND SHABBAT SHALOM, EVERYONE!